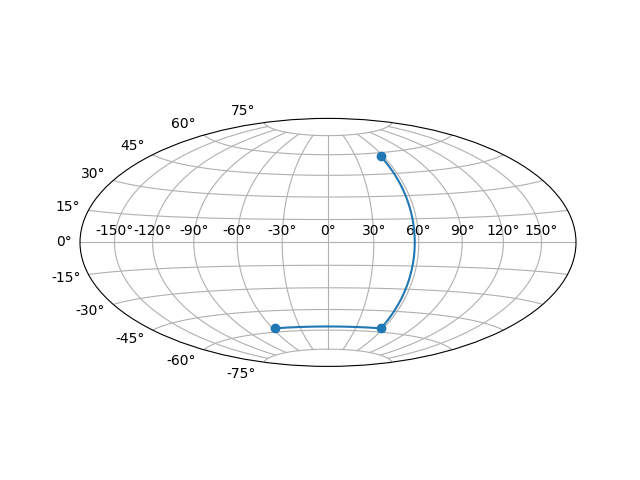 This example showcases the Hammer projection by alleviating many features of matplotlib. # illustrate many features, not all of which will be used every time. unit of radians into degrees and adds a degree symbol. # Axes._init_axis() -- until GeoAxes.xaxis.cla() works. # xaxis tick labels are already on? #       covering the entire plot area. #       often in pixels or dpi/inch. # the inline documentation there. # resizing the window or changing the dpi). # rectilinear space defined in the HammerTransform class. # worry about them too much. # gridlines and tick labels. # transforms are in display space in x and axes space in y. # pixels from the equator. # pixels from the edge of the axes ellipse. msg = "'which' must be on of [ 'tick1' | 'tick2' | 'grid' ]"
msg = "'which' must be one of [ 'tick1' | 'tick2' | 'grid' ]"
background of the plot. It should be a subclass of Patch. # sense, so we don't allow it. # interactive panning and zooming in the GUI interfaces. raise TypeError("It is not possible to change axes limits "
"for geographic projections. Please consider "
In this case, we want them to be displayed in degrees N/S/E/W. Set the number of degrees between each longitude grid. # Skip -180 and 180, which are the fixed limits. # Skip -90 and 90, which are the fixed limits. Set the latitude(s) at which to stop drawing the longitude grids. specify the degree at which to stop drawing longitude grids. analogy in the base Axes class. Return the aspect ratio of the data itself. # so we override all of the following methods to disable it. Return *True* if this axes supports the zoom box button functionality. This axes object does not support interactive zoom box. Return *True* if this axes supports the pan/zoom button functionality. This axes object does not support interactive pan/zoom. path in curved Hammer space.